Another busy week has passed. I would like to thank the school community for supporting us as we have various changes to staffing across the school over the last couple of weeks. Whilst it can be unsettling to some students, staff have worked extremely hard to ensure routines, structures and procedures remain as consistent as possible. It was communicated to 1/2W on Friday, however, Yvette Whalan has had to take some time off for the rest of this term for medical reasons. We wish Yvette all the best and can't wait to see her back at school soon. During her absence Natasha Kapantais will be taking lead on 1/2W with Jo Krippner, Damien Webb and myself supporting. To be transparent and upfront, moving forward, it is becoming more challenging to access casual teachers to replace our staff when they are absent. Like any work place, staff are entitled to leave, and given the profession we are in, I encourage staff to take leave should they need, especially for sick and medical reasons, as we want to make sure we are all 100% when at school to support our students. With the difficulty with obtaining replacement teachers (common across Canberra), there are times when classes are required to be split. We are fortunate to have not had to do a lot of this over this term and really not much last year at all, however, chances are this will have to occur in the coming weeks and months. We do our best and cover classes as best we can from within our own staff but this is not always possible. Again, we thank you for your support regarding this and please know that I am aware and check in frequently with all classes throughout everyday, to ensure a smooth day of learning is occurring. On Friday we will present our first 'Rainbow Awards'. As you would remember, we phased out the 'gotcha' system as it was not valued by students, outdated, inconsistent and placed a heavy emphasis on extrinsic reward. We have moved toward a term award which will be presented to 2 students from each class. These students have been nominated by their class teachers for consistently displaying our school values. 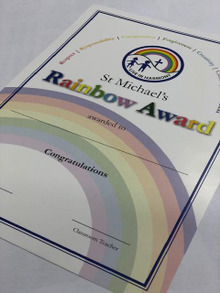 At the end of the year, the 8 students from each class who have received a Rainbow Award, will have a special afternoon with Mr Webb and myself. We would like to thank the Rotary Club of Belconnen for their kind donation of $400. Every year the Rotary Club supports our school by giving a generous donation to assist families in our community that need a bit of extra help with school payments. During Lent, I am reminded to reach out to those in need. There are people within our community who are having a rough time or struggling at present. I would firstly ask you to keep them in your prayers, and secondly, over the next few weeks of term, reach out and connect to someone new, a new parent or family perhaps. This small act of kindness can make a massive different in someone's life. It is that time of year again when we are planning for Catholic Schools Week. For new families, every year we hold a Community Breakfast and invite all those businesses, politicians, friends and Catholic Education staff to celebrate with our school community. This is a catered family event, so please rsvp numbers attending. 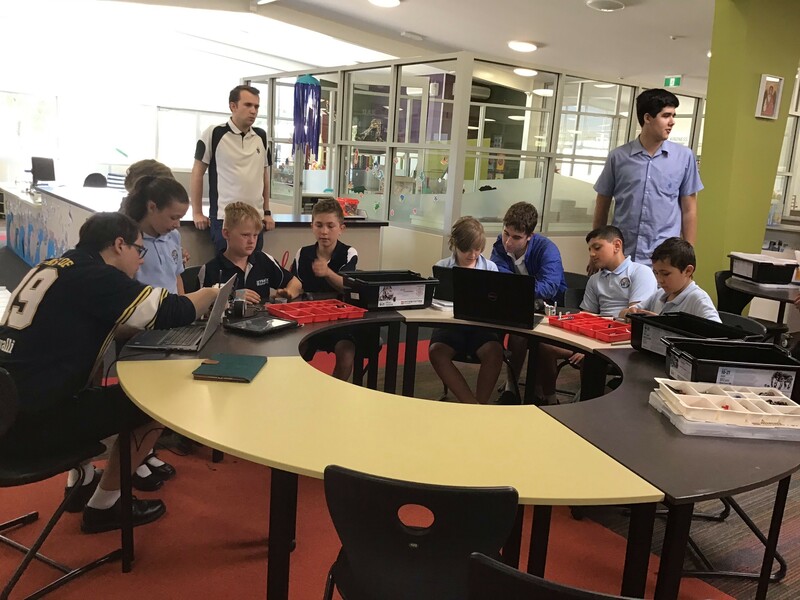 Over the last fortnight, teachers across the school have attended various professional learning experiences from Writing, Arts and Numeracy to name a few. We have started looking closer into the Australian Curriculum and the Achievement Standards (what we would like students to achieve at the end of each year) and teachers working on specific goals linking to particular curriculum areas. As you would notice, our MakerSpace room this year has moved to the C Block Breakout Space. In order to provide opportunities for authentic and regular technology use in the classrooms, it was important to have it readily available for students to access to support them with their learning. Our Tech Support is developing further with Jess Figura visiting classrooms and team teaching with class teachers in this area. SoundsWrite continues to be implemented and embedded into practice in our K-4 classrooms. We are seeing great improvements for this early in the piece and students transferring learning to reading and writing. Our Classroom Support team have been busy forming connections over the last few weeks with students across the school. This can look like one-on-one support, small group or whole class support. We have formed a Year 3/4 Writing Group to support some students who have been finding writing challenging. A Year 1/2 Fine Motor Group has started to support some students with their develpment in this area and a Year 5/6 Maths Extension group will be starting in the coming weeks to challenge and extend targetted students above what is occurring in class. Our Reading with Dogs program continues, providing a fun and engaging reading experience for students. The above are some of the ways of how we are progressing to achieve Goal 1 of our Annual Improvement Plan. Still a long way to go, but we are making good headway. ALL PARENTS PLEASE COMPLETE - FEEDBACK REQUIRED FOR ACTIVE STREETS - THE MORE PARENTS WHO RESPOND, THE BETTER TO OUTCOME FOR OUR AREA! The Active Streets for Schools program is an infrastructure program – supported by educational resources – to make it safer and easier for children to walk or ride to school. Our school will be supported by the program over the next four years. Active Streets helps to make school environments safer and more accessible by providing a range of tailored solutions depending on the school and local environment. Improvements may include new or improved footpath connections, more dedicated crossings or traffic calming (e.g. speed humps) to ensure the trip is safe and easy for children to navigate. To commence the program, Transport Canberra and City Services (TCCS) would like to discover how children currently travel to and from school and find out where you think improvements can be made around the suburb and the school. To drop a pin on the map, you will need to be signed in to a Google account, which is as simple as signing up if you don’t already have one. More information about setting up an account and dropping a pin on the map is available in these instructions. TCCS will also welcome feedback about our Ride or Walk to School map, so please use the drop pin feature to comment on the highlighted routes. Alternatively you can print our map, write on the map and return it to TCCS. Thanks in advance for taking the time to complete the survey. Your response will help to influence how the program is delivered to suit our school community. Thank you to those parents and students who attended our 'Check In Chats'. More sessions will continue tonight. We have received very positive feedback regarding these chats and providing an oppotunity for students to share areas they are focusing on. This is critical to overall success, students knowing that home and school work together to support them, challenge them and affirm them on their learning journey. Don’t forget to keep popping that money in your money boxes. Please return them in Week 10 to the Front Office (or earlier if they are full). Thank you to Mrs Anderson, Ms Kapantais and all of 3/4AK for your prayerful leadership during our Whole School Prayer Time last Friday. What a beautiful way to celebrate Harmony Day. It is that time of the year where students in Year 4 can take the next step on their Sacramental Journey by preparing to receive their First Communion. 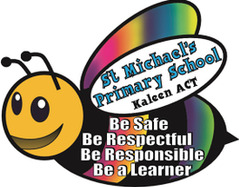 There will be a parent information night on Thursday 2nd May in St Michael’s Church. This information session is for all members of our Parish, Our Lady of Perpetual Help. It will begin at 6:00pm and should be concluded within the hour. Children preparing to receive their First Holy Communion will need to be at a commitment Mass on either Saturday 4th May or Sunday 5th May. Their commitment may be made at any of the four parish masses over that weekend. Mini Vinnies and our Year 6 Harmony Leaders are selling raffle tickets in a monster Easter Raffle. All money raised will go towards our partner school Jariah Education Centre in Kenya. Tickets will be 50 cents each or 3 for $1. Tickets will be on sale in Weeks 9 & 10. The raffle will be drawn at Friday morning assembly in Week 10. We wish all our competitors well as they represent our school at tomorrow's carnival. Information has come home to all players regarding teams. The draws will be available late next week, please continue to check the St Clare of Assisi website and the Facebook page for the most up to date information regarding draws and results. Darren Houlihan's 3/4 team are having training next Tuesday and Thursday from 3.30 till 4.30 on the school oval. Parents will need to be responsible for supervision during this time. We are looking forward to our carnival next Thursday. We will kick things off at 9:30 and will be finished by recess time. Parents and carers are welcome to attend. Please ensure that your child has sunscreen and additional water with them on this day. Students will wear full sports uniform. Thank you to the kind parents who have volunteered to assist on the day. Could you please see Mr Webb when you arrive. We have had another successful week in the Greenhouse this week. We have continued to germinate new seedlings within the greenhouse and we have moved some of the more mature plants into different gardens around the school. The Sustainability leaders were able to pick different fruits and vegetables and have continued to show great leadership with keeping the greenhouse running well and looking after the fish. The students have continued to enjoy their learning during sustainability lessons. We will continue to look at the energy consumption of the greenhouse and the energy that we are saving through the collection from our solar panels. On Friday the 29th of March, St Michael’s will be taking part in Earth Hour. During this time we will be turning off our lights and trying to minimise the amount of electricity that the school consumes. Through the week our Year 6 Sustainability Leaders will be visiting all classes to present a short presentation and explain to all classes how all students can be involved at school and at home. We are in the final stages of putting together our ‘Parent Green Team’ which will be helping with planting new plants, moving plants in to different gardens and also small landscaping projects. If you are interesting please send Mr Webb an email to get involved. Any time that can be spared is greatly appreciated and helps to build a strong culture of sustainability within the school. The March Community Council was, of course, opened with enthusiastic discussion on the wonderful Fete which raised just over $10 000 for our school. Everyone considered it an extremely well organised event and a great representation of school spirit. It was noted that many of the families who came stayed for the duration of the event owing to a range of well-chosen activities and great atmosphere. Matters then moved to planning for the year ahead. We looked at the roles/obligations of Community Council members and the current financial situation, which was considered good thanks to a successful fete. However we noted the need for careful financial planning as there are many regular expenses, particularly the Greenhouse. Investigation was initiated to prepare a more detailed estimate of annual expenditure associated with this project. Other expenditure foreshadowed for the year included maintenance of the oval, TV screens in the church to replace the failing projectors and, in the long term, air conditioning. Next up came talk of social/fundraising events for the year, with the Catholic Schools Week Breakfast and a Disco coming up in Term Two. In Term Three we will aim to repeat last year’s successful family movie night but split it across two events: a family one and a specific year 5/6 movie night. A Trivia Night is also slated for later in the year. Finally, we touched on the need to identify parents and friends of the school with useful skills that they would like to share. If you or someone you know has a special talent or interest, such as sustainability/gardening, we would love for you to get in touch with Council. Might be a great way for grandparents to get involved! This year St Michael’s is involved in the Robocup competition. At present we have two teams representing the school in the Rescue section. The Rescue competition mirrors the real life use of robots that rescue people from life-threatening situations. 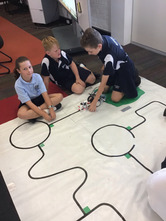 Students must build their robot using Ev3 and Mindstorm LEGO robotics kits, then program these to navigate a track and find the victim. The competition will be hosted by St Francis Xavier College in September. Recently, we hosted a building day with St Francis and St Monica’s students. If you would like further information about this competition please contact Jessica Figura. Thank you to everyone that purchased books at this year's fair, we were lucky enough to receive $800 worth of books and resources for our library. A great effort everyone, and our students now have some great new reading material to enjoy. We are still looking for helpers in the library who are able to cover books, please see Mrs Hardwicke if you can assist in any way. Books can be covered either at home or here at school. The app of the week is Giphy. Search through the library or create your own, a gif is a great way to entertain the whole family. Also fabulous to be used as a stimulus for writing tasks at home. Get creative with Giphy. Congratulations to the following children who have achieved a Harmony Award in Week 8 and will receive their award this Friday at morning gathering. School Photos for 2019 will be taken on Monday 8th April. Envelopes have gone home and are due back to the Front Office by Friday 5th April to ensure a smooth running of the day. If you would like sibling photos taken, envelopes are available at the Front Office. If you are ordering three student packs the sibling photo is free. If your child/ren will not be here on photo day and you would still like to have their individual photo taken, please see Lisa in the Front Office for more information. 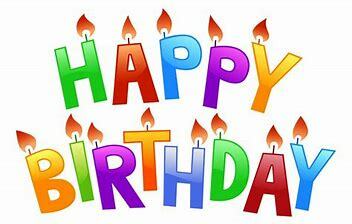 We hope you have a great day!! All lunch orders need to be placed by MIDNIGHT 12am on Wednesday nights. If your child is missing something from their lunch order, it is important that they go to the canteen, let them know and it will be sorted out for them straight away. Your help with this is greatly appreciated. It is too late once they come home from school. The canteen still require assistance on Friday's from approximately 12.30-1.45 to help pack lunch orders, if you can assist in anyway, please contact Lisa in the Front Office. Any help is greatly appreciated. Please feel free to contact Empire Catering on 0408200481 for any queries with lunch orders or any constructive feedback you have regarding menu items. As we outsource to Empire to cater for our canteen each week, we would appreciate you communicating directly with them regarding any issues, problems or concerns you may have regarding the canteen. I have had a couple of sandwich bags of the Coles Stickeez handed in to the Front Office. If your child has misplaced their bag, please come and see Lisa in the Office to claim them. A reminder that toys/stickeez should not be brought into school as they quite often get lost or misplaced. Next Saturday, 30th March there will be a pre-Easter / Autumn general tidy up around the church garden and grounds. Work will commence at 9:30am and all helpers are more than welcome! Just bring your energetic selves and some gardening tools and implements. Refreshments will be served for all the willing workers. Hope to see you there! Each year during Lent, we have groups who meet throughout the parish to reflect on the Sunday Lenten Gospels. Sheets are available in the church foyers to enrol or if a Friday morning at 9:00 am suits you better, Sr Kate holds a group at her place, which you are more than welcome attend. Sessions last for about an hour over a cup of coffee. Everyone is welcome, so if you are able to join in, let Sr. Kate know on k.mcmahon3@bigpond.com (Home address will be supplied.) Groups begin on Friday 15th March. Do not touch, pick or eat any wild mushrooms! Death Cap mushrooms are one of the world’s deadliest mushrooms and can currently be found across the Canberra region. Since 2002, there have been four deaths and several poisonings in the ACT due to Death Cap mushrooms. In Canberra, Death Cap mushrooms often grow near established oak trees in mild, moist weather. Death Cap mushrooms have previously been found growing on school grounds in the ACT. Parents and teachers are asked to remind children not to touch, pick or eat any wild mushrooms. As the Death Cap mushroom can easily be confused with edible varieties, People are also strongly advised not to touch, pick or eat any wild mushrooms. It is difficult, even for experienced collectors, to tell the difference between the Death Cap mushroom and edible wild mushrooms. All parts of the Death Cap mushroom are poisonous and eating part of a mushroom can be fatal. Cooking the Death Cap mushroom does not make it safe. If you suspect that you or one of your family members might have eaten Death Cap mushrooms, you should seek urgent medical attention at a hospital emergency department. If you believe you have seen a Death Cap mushroom, keep children and animals away and do not touch the mushroom with your bare skin. If it is growing in a public area, please contact Access Canberra on 13 22 81. If it is in your own yard, wear rubber or plastic gloves and remove the whole mushroom, including any part under the ground. Put it straight into a plastic bag, put the bag into the rubbish bin and then wash your hands. From the commencement of this year there will no longer be Belconnen Region level trials for specific sports. To replace the regional level completion, many sports are holding gala days for schools to attend. We will enter teams in these gala days where there is student interest. The pathway for selection to an ACT sporting team is through trials offered in the same way as they have been previously. Please see the information below in relation to the process of registering your child for ACT trials on the School Sport ACT website. Please keep a n eye on the School Sport ACT website www.schoolsportact.asn.au for upcoming ACT trials. The process for registering can be found below. If you need any assistance registering your child please feel free to ask for assistance. School Sport ACT now collects all registration information online – this is to prevent the movement to and fro of a paper note and have all information readily available to officials prior to the trial. As this process incurs a fee for data storage, system maintenance and admin, a small $5 fee payment via credit card will be required. A confirmation email will be sent to your chosen email that will contain a link that you must click on to verify the email account. You will see a ‘dashboard’ of your information, click green box to Add Student – enter student and medical details and save. Go to the Sports Tab – choose your specific sport, click on Trial Information box then click on the Register to Trial link. Select your child’s name from the dropdown box and then enter the optional fields for Playing History, Preferred Position (if applicable) and Representative Experience. 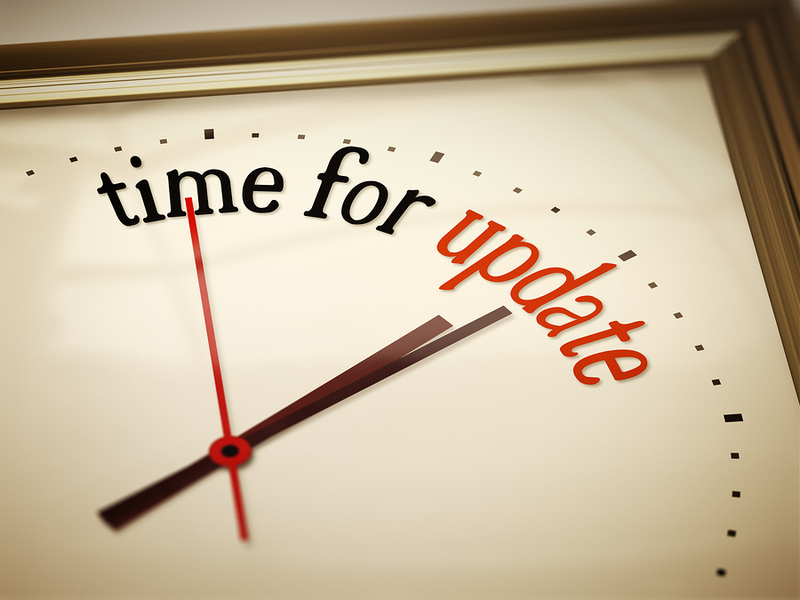 If you are already in the system, ensure your child’s school is up to date in your profile – have they moved onto High School? Make the $5 credit card payment then click to register. An automated email will then be sent to your Principal/School Approver for their approval to trial (no need to take anything to school for the Principal to sign). You will be able to see the process has been complete back in My Profile – once your Principal/School Approver has completed the approval process your child’s information will be collated onto a list for the Team Manager and Coach prior to trial. Note the registration process closes two days before the first trial date to allow sufficient time for approval and sharing of collated information.